Another favourite among kids is our peacocks. With their impressive colours, you may be lucky enough to see the males fanning their tail along with an almost dance-like courting. Don’t forget… these guys love peanuts too! Peafowl is the correct species term for both males and females. Peacock is the term reserved for male, while females are called peahens. The males are the most extravagant with iridescent tail feathers and loud calls. The tail also called the train is used to impress and attract females. Living together in the United Nations, is our blue Quaker parrot, a Love Bird, a Blue-cheeked Amazon, and 3 small quails. Typically, our love bird spends most of its time in the nest while the Quaker spends most of her time guarding the nest. Ripley, our talkative blue-cheeked Amazon, is quite the chatty bird and will often be heard saying “pretty, pretty bird,” “hello rip,” “how are you,” and can also meow and catcall. Come meet him and say hello! Apart of the falcon family, the kestrel is widespread throughout Europe, Asia, and Africa. Being a bird of prey, the kestrel is a carnivore preferring small mammal prey such as voles, shrews, and mice. Females are significantly larger than males. In some regions, the Kestrel does migrate south in the winter but relatively are sedentary. Make sure to look up when you get to Medusa’s enclosure. Spending most of her time high up, she appears to be watching everyone and everything in her vicinity. Typically fed after-hours, Medusa becomes very vocal when meat is around. If you’re around to see it on Sundays, you may get to watch her dive straight to the ground to pick up her meat. 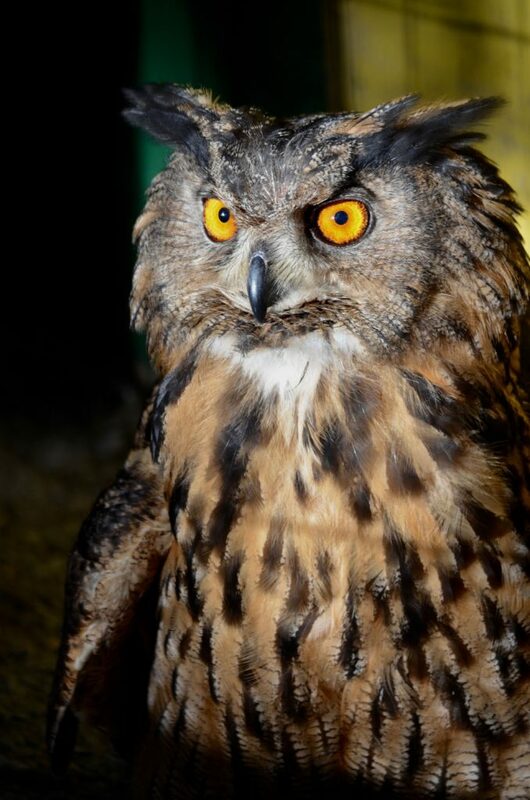 Themistocles (or “T” as we like to call her) and Aristotle are our impressive Eagle-owl pair. They are not hard to miss as both are significantly large, and their striking orange eyes will likely be on you. Usually seen on the back perches, you can still be able to see their incredibly long talons! Also called the European eagle-owl, this species is one of the largest owls in the world with wingspans reaching over 6 feet. Widely distributed, the eagle-owl is found in various habitats such as coniferous forests, mountain regions, steppes and other remote places. Being a predator, the eagle-owl prefers small mammals as well as reptiles, fish, and larger insects. As you walk towards the woods, it is impossible to miss Borus and Matilda. Settling in nicely to their new home, you may get to see them on the closer enclosure perches. 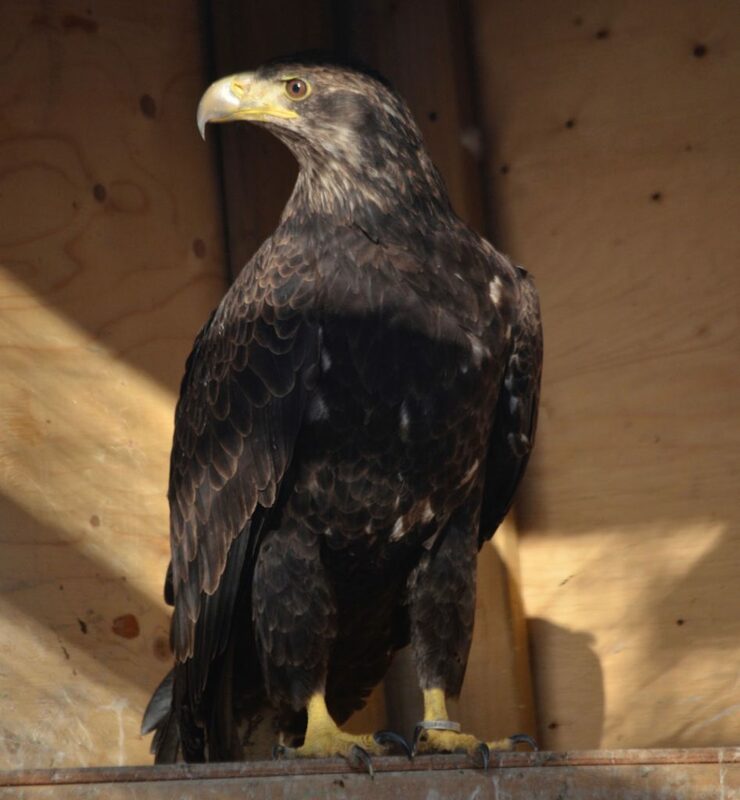 Both rescues, Borus and Matilda were injured in the wild and can no longer long-distance flight. Due to this impediment, neither could be re-released as survival would be unlikely. They arrived this past winter into their brand new enclosure, come see them up close! Native to North America, the bald eagle is generally found near large bodies of water and old-growth trees that are used for nesting. The bald eagle has the largest tree nest recorded of any animal species. Their diet largely consists of fish but being opportunistic, will eat various other prey as well. Being sexually dimorphic, females are about 25 % larger than males. 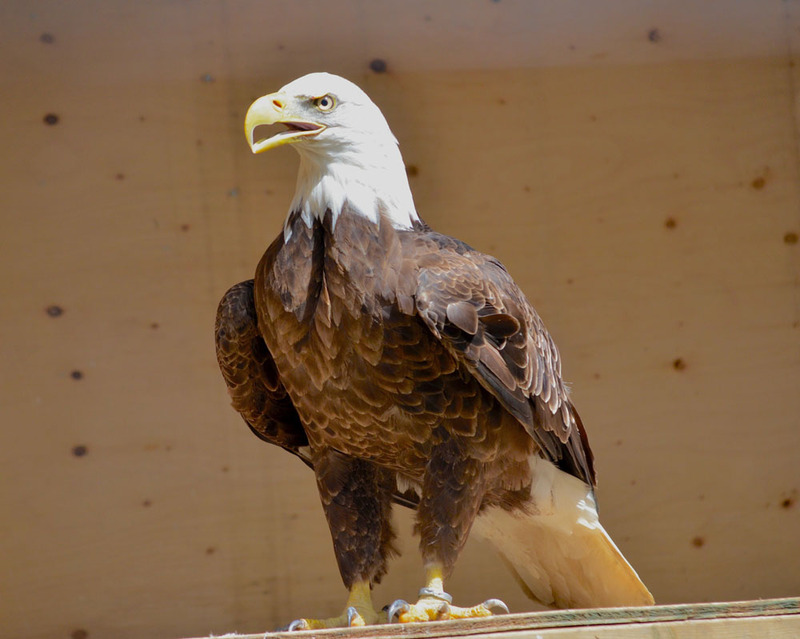 Within some North American cultures, the bald eagle is seen as spiritual messengers between humans and gods. The feathers are used in many traditional native ceremonies. Lancelot and Guinevere, our striking Harris Hawks, live out in the field next to the deer. If you catch them on a rainy day, you may get to see them enjoy bathing in the showers with their wings out in full span. Being a territorial bird, you will often hear them squawk while guarding their territory. If you get to see them at feeding time, you may get to see them dive for their meat and guard it as well. A medium sized bird of prey, the Harris hawk is native to Southwestern United States and South America. The Harris hawk is most known for its hunting behaviour, where individuals will work together and hunt cooperatively in packs. Females are typically the most dominant bird within a group of individuals. Due to its social behaviour, the Harris hawk has become one of the more popular birds used in falconry. The great horned owl is native to both North and South America. With a vast range and variety of occupied habitats, this species is very adaptable. The owls diet consist of mostly small mammals such as mice, rats, hares, and rabbits. The great horned owl is one of the earliest nesting birds in North America. 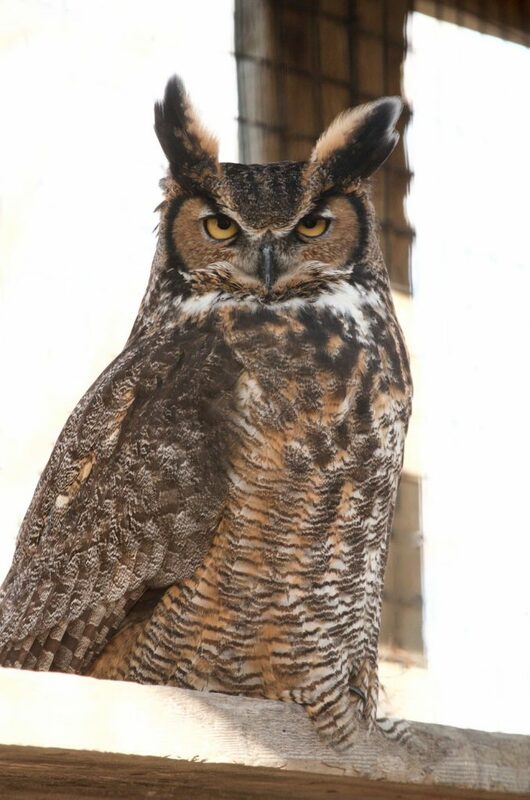 Characteristic to the name, the great horned owl has feathered tufts on its head called plumicorns. The purposed of these tufts is not fully known but may serve as a visual cue for other owls. Make sure to look up high when you get to the sheep field. Lincoln, our great horned owl lives in an enclosure within our Jacob Sheep field. Being nocturnal, he tends to spend most time on the shaded perches. Later in the day, he tends to spend more time close to the front on his tree perches.